To celebrate the occasion, let’s turn our conversation onto the subject of couples. We have seen them all throughout the years: kings and queens, bread and butter, cheese and tomato, fish and chips, Fred and Ginger, you get the general idea. Kicking off our list is what can be considered the gold standard in onscreen romance, and one that would likely have had the likes of Ronald Reagan (allegedly) and Hedy Lamarr kicking themselves for turning down. Cynical café owner and expatriate Rick Blaine and his now married former love Ilsa Lund once again meet in the Moroccan city of Casablanca, while World War II rages on and Ilsa and her husband are pursued by Nazi forces. 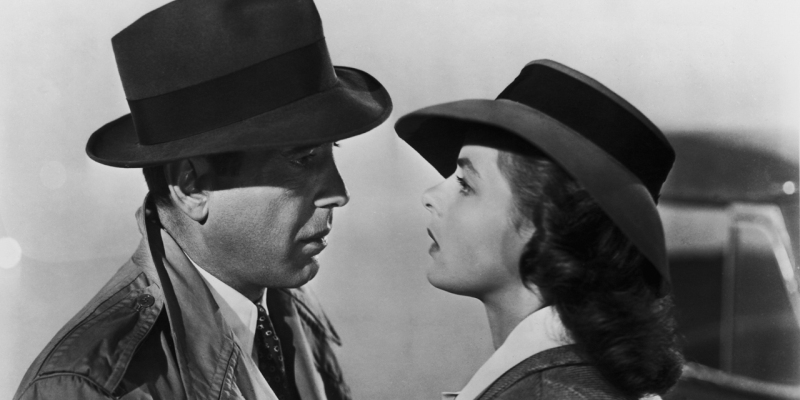 Forced to confront past issues, Rick and Ilsa take a trip down memory lane all the while attempting to avoid authorities and attempting to smuggle Ilsa and her husband out of Casablanca. What makes Bergman and Bogart such a memorable pairing is the sense of loss and the dialogue the two of them share (“we’ll always have Paris”), doubled by their Academy Award nominated performances and the bittersweet ending that I shan’t go into any detail about. Purchasing the movie will answer the questions that I leave unanswered! Okay dear reader, here’s a question for you. What happens when a man falls in love with his mobile software? No, you may not say that episode of The Big Bang Theory. For there is a better answer to that question in Spike Jonze’s science fiction romance Her. Theodore is a quiet, anti-social individual coping with the forthcoming divorce from his long-time wife, who gets a new lease of life in the form of operating software with AI Samantha. Joaquin Phoenix delivers another fine performance in the comeback stage of his career, with the shy and depressed Theodore serving as a sharp contrast to the unstable and alcoholic Freddie Quell of The Master. The main showcase, other than Spike Jonze’s Oscar winning screenplay, of this pairing however is Scarlett Johansson as Samantha, whose voice performance is right up there with the likes of Robin Williams in Aladdin and Ellen DeGeneres in Finding Nemo. Her performance makes you forget that she is not even in the room in the scenes Theodore and Samantha are together. This story also pretty much acts as a commentary on the effect social media and the expanded use of personal electronic items has on our daily lives. Now onto something a little more sinister; in fact, they even have a recognised mental disorder named after them (thank you QI for that bit of information). Observe as director Arthur Penn delves into the tropes of early Hollywood cinema and the French New Wave to bring the infamous Bonnie Parker and Clyde Barrow to life. Of course, we can’t forget Warren Beatty and Faye Dunaway’s career-defining part in bringing the fabled outlaw couple to life either. Though slightly romanticised, the film offers a look at a doomed, oddly matched pairing between a good girl gone bad and a born criminal. As the tagline says: “They’re young… they’re in love… and they kill people”. When you look back through the history of cinema, nothing says macho bravado like the cowboy. An archetype of chauvinistic masculinity epitomised by the likes of John Wayne and Randolph Scott, the cowboy is a prominent element in the art of film. Brokeback Mountain, adapted from a short story by E. Annie Proulx (The Shipping News), takes this archetype and turns it on its head in a big way. The year is 1962 and Ennis and Jack have been hired as shepherds, where they emotionally connect one night in a scene of… well I can’t describe that scene since I’m writing for a professional blog, not some dark corner of deviantART. The sense of loss and impending tragedy is also present here with the addition of historical subtext surrounding American views on homosexuality and the lives the two men have to lead when married to women. And now onto our final couple, an animated couple made up of two different species surrounded by characters from Disney and Warner Brothers animation (though this film was made under Disney’s Touchstone Pictures banner). I am of course referring to Roger and Jessica Rabbit. He’s a goofy animated rabbit, she’s the animated equivalent of a film-noir femme fatale and both paired up with grouchy live-action Bob Hoskins as PI Eddie Valiant. What more could you ask for? How about a perfect send-up of the film-noir genre, a relationship that will keep you guessing and all your favourite animated characters surrounding this couple? Check it out as soon as you can! Planning a romantic night in this Valentine’s Day? Check out our huge range of DVDs and Blu-Rays from just £1.19 plus FREE delivery!